Kashinath Thakur, who has just returned to work after a month-long vacation, was busy tightening screws on a huge steel plate which will be placed on the waist of the statue of Sardar Vallabhbhai Patel. The ‘Statue of Unity’, under construction at Kevadia in Gujarat – near the site of the Sardar Sarovar dam on the river Narmada, will be the tallest statue in the world. Its height, metres, will be double that of the Statue of Liberty in the US and five times that of the statue of Christ the Redeemer in Rio de Janeiro, Brazil. The project to build this statue is a brainchild of prime minister Narendra Modi. What does he knows about Sardar Patel? Kashinath, a 40-year-old from Deoria district of Uttar Pradesh, responded: “Bade aadmi the. [He was a great man. ]” His colleague, Shriram Singh from Digrauli of UP, interrupted him. “He was the Iron Man. He united the entire nation. He dreamed of the Sardar Sarovar dam,” says Shriram who then looks around for appreciation from senior architects and engineers who are busy making preparations ahead of the prime minister’s visit, on September 17. Both the workers are employed with Malaysia-based Eversendai which has been given the contract for the steel framework. This company has earlier worked in projects like Dubai’s famous high rise like Burj al-Arab and Burj Khalifa. “It’s only the PM who has decided to make the name of Sardar Patelji so big that the entire world should remember this. The Statue of Unity is the vision of our PM. We are on our toes to complete the statue before the deadline of October 2018 so that it can be inaugurated on Patel’s birth anniversary [October 31],” says RG Kanungo, superintending engineer of Sardar Sarovar Narmada Nigam Ltd (SSNNL), which is the executing agency for the state government. Some 3,000 workers have been at work day and night in shifts since October 2013. The structure has reached just above the knees and now the engineers are busy shaping the kurta. People from TQ Art Foundry of Jiangxi Tongqing Company in Nanchang, China, too will soon arrive to assist SSNNL in assembling the bronze cladding of the frontage. “The framework is a mixture of concrete and steel. For the cladding, TQ Art Foundry has designed 5,000 bronze panels under the supervision of artist Ram Suthar, which will be placed over the steel and concrete. Thousands of high-quality prototypes of precast bronze frontages will be shipped in from China which we will later assemble over the steel plate at the final stage of the statue,” says Kanungo. He adds that from China, not just bronze but around 100 workers too will arrive to work on the statue at the last phase. Claiming the statue to be completely earthquake-proof, the SSNNL engineer claims it cannot be affected by any natural calamity, be is caused by air, water or gravitational force. “We have dug out more rock from the hill then the material we are using to build the statue. All tests have been done before choosing the site to ensure the safety. It will be a landmark in India after it is completed,” he adds. 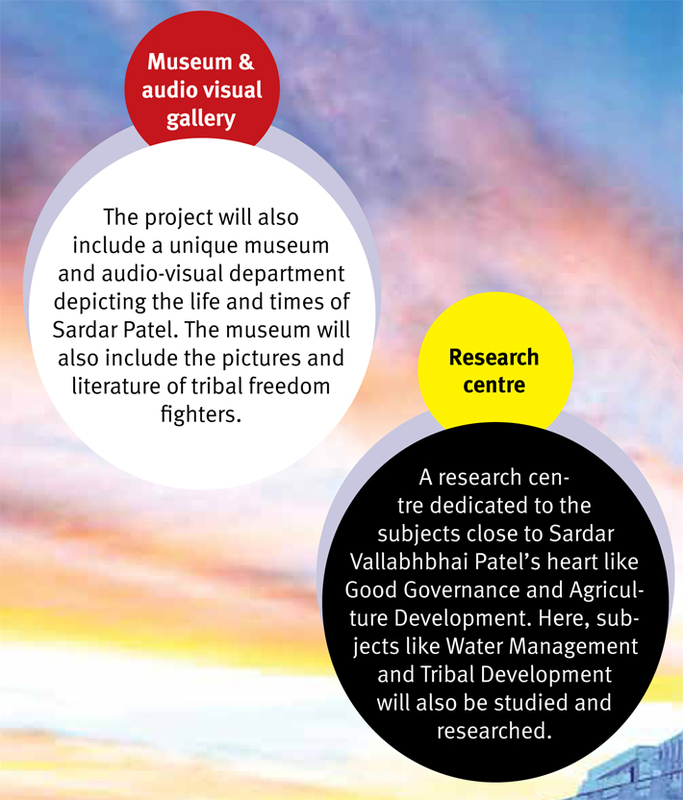 It promises to be a tourist attraction – along with the Narmada dam nearby. The 182-metre tall statue is being erected on a small rocky island, named Sadhu hills, in the middle of the Narmada riverbed facing Sardar Sarovar dam at Kevadia. The statue will have steel framing, reinforced cement concrete, and bronze coating. The construction is estimated to cost Rs 2,063 crore, and will be completed in four years. More than 60,000 tonnes of steel will be used. The statue needs 75,000 cubic metres of concrete, 5,700 metric tonne steel structure, 18,500 tonne reinforced steel rods, and 22,500 tonne bronze sheets for construction. 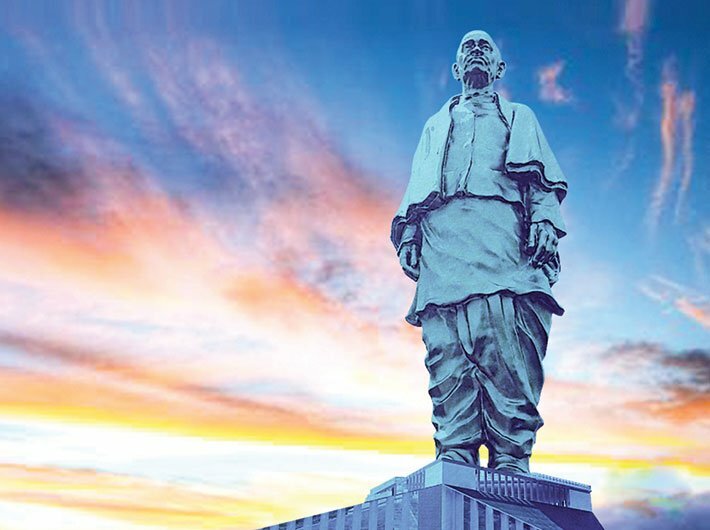 The agricultural iron was collected from farmers of Gujarat that has been used in the statue as a symbolic contribution highlighting the participation of farmers in the idea of paying tribute to the Sardar. The Gujarat government has constituted the Sardar Vallabhbhai Patel Rashtriya Ekta Trust (SVPRET) which has collected the iron from some 7,000 villages which was then melted and was used in a few parts of the statue. A consortium of Turner Construction (project manager of Burj Khalifa), Michael Graves and Associates and Meinhardt Group, is supervising the project. Visitors will be able to rise up to the height of the structure’s chest, walk into a viewing gallery and enjoy a panoramic view of the Sardar Sarovar project (SSP) and the surrounding region from an astounding height of close to 400 feet. The observation deck at 500-foot can accommodate 200 people in one time. Visitors will also be able to see the beautiful Satpuda and Vindhyachal mountain ranges, the 256-km long Sardar Sarovar reservoir and the 12-km long Garudeshwar reservoir. According to the agreement, L&T will maintain and manage the project site for 15 years after completion of the construction for which it will be paid Rs 657 crore. The project site will be completed with modern infrastructure which will support better standard of living for locals as well as better connectivity for visitors. The project site will be connected with modern connectivity infrastructure such as expressways, improved rail system and helipads. Through scientific area planning, clean industries will be located around the project site. Research facilities in the area of biotechnology, clean energy and ethnic crafts will generate white collar jobs in this area. Location and development of educational institutions in the areas of agriculture, animal husbandry, pisciculture will generate an educational and skill development complex to support economic activity in the region. Development of tourism infrastructure to support MICE – Meetings, Incentives, Conferences and Exhibitions; which will generate livelihood opportunities for the local tribal population.